We recently went to a holiday party where I took a gorgeous cranberry-swirled cheesecake for dessert … for the adults. It was a huge hit, but I knew it probably wasn’t going to be the right sweet treat for all the toddlers and kids who were there. So I turned to an old favorite for the kids—Rice Krispie treats. But this time, I made them into a festive Christmas tree nobody could resist! 1. Melt marshmallows and butter in microwave, stopping after 1 minute to stir. Heat another 30 seconds or longer (until melted). 2. Stir in a few drops green food coloring to tint marshmallows green. 3. Stir in Rice Krispies until thoroughly coated. 4. Spray jelly-roll pan or cookie sheet with sides with non-stick spray and press Rice Krispie mixture into pan. 6. With a greased knife, cut out shape of tree and transfer to a lightly-sprayed serving platter. 7. 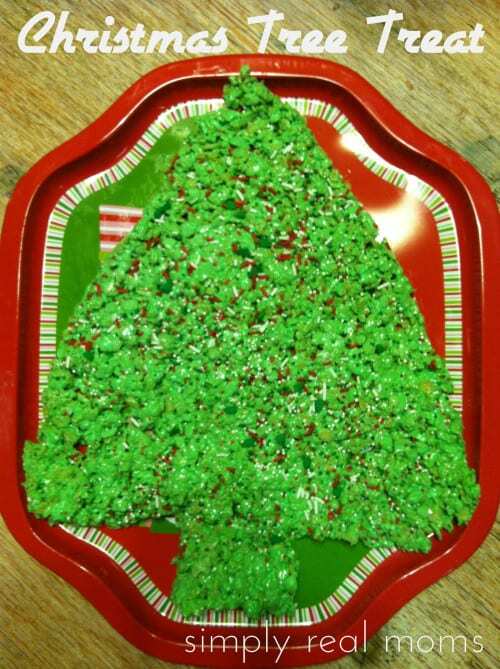 Use smaller Christmas tree cookie cutters to cut trees out of remaining treats.